I’m all about saving time as a new mommy but I still want to have great hair, so when I got a free sample of Macadamia Flawless Cleansing Conditioner, I was super excited but also very skeptical. I’ve tried washes before that are suds free and claim to do the work of shampoo and conditioner but they either left my hair super dried out or very heavy feeling. 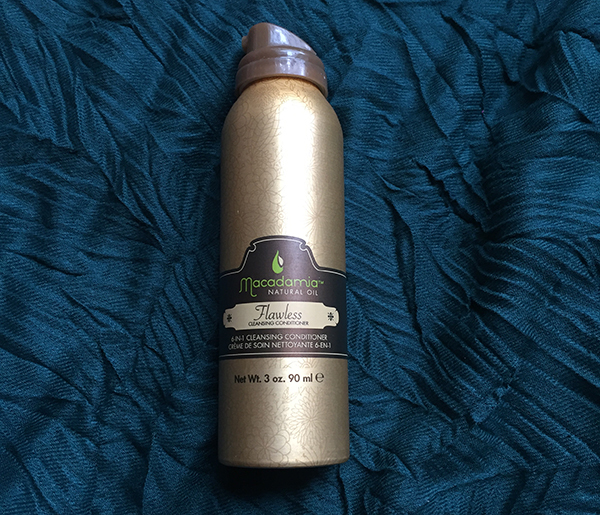 This product not only claimed to do the job of your shampoo and conditioner but it also promised to care for my hair, cut down blow dry time, and help with frizz. I pretty much thought it was too good to be true. Well, I will have to say…this time, I was wrong! This product was fabulous! My biggest critique with it is that, on the bottle, it doesn’t tell you how long to leave it on? Also, do you rub it in and rinse it out quickly, like your shampoo, or put it on and leave it for a few minutes like your conditioner? I decided split the difference and I left it on for about a minute and a half, after making sure I covered thoroughly from the scalp down. The product also promises to nourish your scalp and leave you without oily hair. After I rinsed my hair, It had that nice silky feeling, as it does after a good conditioning. When I got out of the shower, I applied all my normal products so that I could really test to see if it worked in comparison to my normal shampoo and conditioner. I was also pleasantly surprised to find that it did in fact help cut down my blow dry time. I also felt like my hair was a lot less frizzy and had great volume to it. It also didn’t feel weighed down with product nor did my hair look oily, which sometimes happens when you add product in. Skipping an extra step in the shower and still getting great hair as a result? I’m in love!